Beautifully engraved certificate from the State of Colorado for the election of a member of the House of Representatives, James A. Mc Candlass issued in 1880. 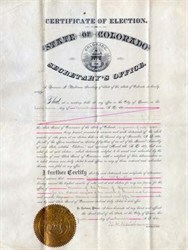 This historic document has a vignette of the coat of arms for Colorado. This item is hand signed by the Secretary of State, Norman H. Meldrum and is over 123 years old. Mr. Meldrum had served with a New York cavalry regiment, coming to Colorado to seek his fortune. In Colorado, he became engaged in politics and served as Secretary of State and a term as the Lieutnant Governor.